It’s Thursday, January 18, 2018, and, dammit, a fast day for me. (This is getting tiring.) It’s National Gourmet Coffee Day, which, in the form of a homemade latte, is the only thing besides water I’ll consume today. It’s also the beginning of the Week of Prayer for Christian Unity, which is repugnant, but since prayer is ineffectual, innocuous as well. After cremating his dead son in 1884, Price was arrested and put on trial by those who believed cremation was illegal in Britain; however, he successfully argued that there was no legislation that specifically outlawed it, which paved the way for the Cremation Act of 1902. Upon his death, he was cremated in a ceremony watched by 20,000 onlookers. Two events in Poland on this day: in 1919, Ignacy Jan Paderewski, a pianist and composer as well as a statesman, became the Prime Minister of the newly independent Poland. And in 1943, the first uprising of Jews in the Warsaw Ghetto took place: when Nazis began deporting people from the Ghetto, the Jews fought back with weapons. They lost, of course: it was all over by May. On this day in 1977, the bacterium that produced Legionanaires’ disease, a previously unknown microbe, was identified as the disease’s cause. Finally, on this day in 1993, Martin Luther King, Jr. Day was officially observed for the first time in all of America’s 50 states. Notables born on this day include Daniel Webster (1782), Paul Ehrenfest (born 1880, sad end to his life, but look it up), A. A. Milne (1882), Oliver Hardy (1892), Cary Grant (1904; real name Archibald Alec Leach), and Danny Kaye (1911; real name David Daniel Kaminsky). The song was made famous, of course, by Linda Rondstadt, and you should also watch this version in which Linda sings with Kate, Anna, and, I believe, their older sister Jane. I think the other singer is Maria Muldaur, though I’m not sure. You can see a nice half-hour documentary about Kate and Anna here. Meanwhile in Dobrzyn Hili is still hatin’ on winter. She also looks quite round. Hili: To jest twoje zdanie. From reader Barry. Do you think this video is for real? This entry was written by whyevolutionistrue and posted on January 18, 2018 at 6:30 am and filed under Hili Dialogue. Bookmark the permalink. Follow any comments here with the RSS feed for this post. Both comments and trackbacks are currently closed. A video of Curly’s grave is posted on youtube. The coins/stones are moved around in that one. I imagine that is what happened in that pic. At least embed a video that features curly for crying out loud. It is his death anniversary after all. Here is a clip from the great short “Hoi Polloi” where the guys take on the nature vs. nurture debate. That’s the other 3rd stooge, Shemp, not Curly. I’m voting for real on the snow cat and that its’ name is Streaky. Agreed. I have seen other videos showing much the same thing. If they live in a place that gets regular snow, the cat knows snow can be moved in order to get to something. The cat’s reaction to seeing the door blocked by snow is bound to be to attempt to dig through it. Cat video is staged, you can see the arm that launched the cat through the snow to the right of the door frame. The cat also comes through the snow sideways as opposed to straight on as it would if it were leaping through the wall of snow. I recommend what Penn did – eat potatoes. Only potatoes. Maybe add spices. For a while. It’s my second time doing this, and I think it’s better in general to have something in the system than to cold fast. Sorry for diet advice mixed with good advice. I followed Penn’s diet, mainly, and lost 65 pounds. Well done – imagine carrying around six 10-pound free weights. Interesting bit about Glenn Curtis and his Curtis Pusher airplane. He used ailerons for lateral control on this airplane partly because the Wright Brothers had patents on wing warping used on their plane. Many think that Curtis invented the aileron but actually it was a British scientist years earlier, Mathews Boulton. It appears to be some sort of cat toy. The drinking lesson looks like the mom’s mirror neurons are triggered by junior’s crude attempts. The goal of drinking is clear to her but dimly glimpsed by the youngster. Like when you have the urge to complete someone else’s sentence. Just to show how closely I read this science post: I don’t think that’s a seaweed next to the the amphipod. It’s a hydrozoan colony (a benthic cnidarian). Caprellids are often found on hydroids, and I think they eat the polyps. Thats a name that rings a bell, but only faintly. Seafloor mapping? 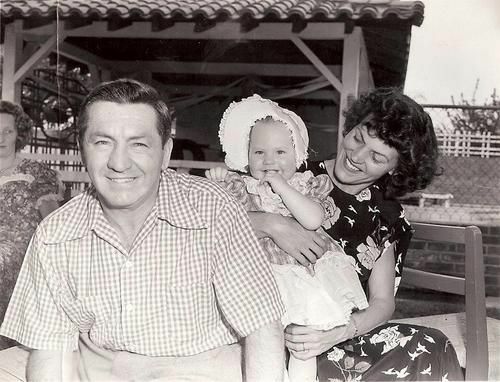 Here’s a rare shot of “Curly” Howard with hair and the wife of his most successful marriage. Have you considered the 12/8 method of intermittent fasting, PCC(E)? It’s easier than the 24-hr fast. You mean some people *haven’t* repeatedly played Zombie at full volume this week?? My WordPress Reader can’t seem to show the Twi**er posts, and even the website isn’t showing them. Anyone have any solutions? Musical videos were great. Christian unity, eh? Wonder if they are going to gather representatives from all 40,000 plus brands of Christianity. The cat videos are great!